I made my favorite recipes for scones for our St. Patrick's Day celebration. I don't know if scones are Irish fare but I don't care! I got this recipe last year from the Elmwood Inn website. Everyone really enjoys them and they can be made without sugar for those who would prefer a recipe without. My notes are in brackets. Preheat the oven to 400º F. Lightly grease a large baking sheet. Combine flour, baking powder, salt, and soda. 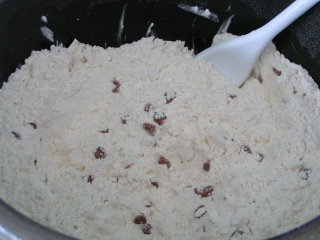 With a pastry blender, cut in butter, mixing it until the mixture resembles coarse crumbs. Mix in currants [cinnamon chips]. Whisk buttermilk and egg together, then add to flour mixture. Stir together until a soft ball of dough forms. Turn onto a lightly floured surface and knead gently, turning five or six times. Roll out dough with a floured rolling pin to about 1/2 inch thickness. Using a heart-shaped [clover] cookie cutter, cut scones out and place on the baking sheet. Brush the tops lightly with cream and sprinkle with sugar [sugar pearls - I sometimes use cinnamon and sugar]. Bake 10 to 12 minutes or until light brown. Serve warm with lemon curd, clotted cream, or preserves. Makes one dozen scones. Time Saving Hint: Raw scones may be frozen and then baked fresh as you need them. See my Scones photo album for more photos including who helped, who didn't and a surprise guest!